The garden heathers are in bloom now and the bees are all over them whenever the weather allows. These are not to be confused with the Ling heather (Calluna vulgaris) we see on the hills in the late summer – they are all Erica species, mostly varieties of Erica carnea or E.cinerea. Erica specialists please correct me here. 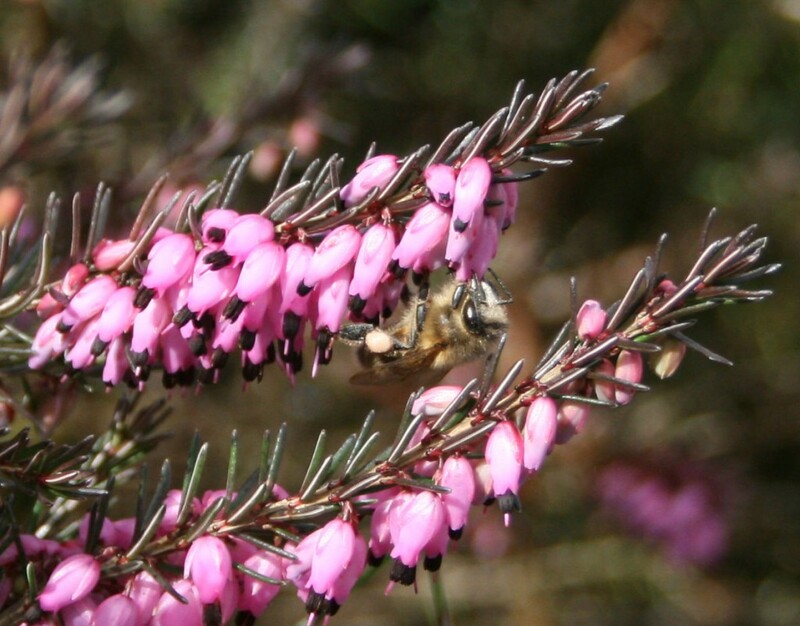 Here is a photo of a heather bee and you can see her pollen bags are quite full with pale grey pollen. Note also her face is all white with pollen. If you see your bees coming in with pale grey pollen and white faces at this time of the year (February) it will have come from garden heathers. I should add that bell heathers which can be seen all over the Mourne Mountains in Co.Down are Ericaceae – E.tetralix or E.cinerea. But these flower in late summer whereas garden varieties tend to bloom in winter/spring. The other big difference is that the wild Erica species do give a crop of honey for the bees. Garden heathers only offer early pollen. Bell heather is extremely dark coloured honey – almost black as Guinness. It is extractable too – unlike Ling heather honey.